Lakes and forested hills in this sprawling park provide good tramping, and contrast with the rugged alpine environment of Arthur's Pass National Park to the southwest. Highest point: 1980m (Mt Crossley). 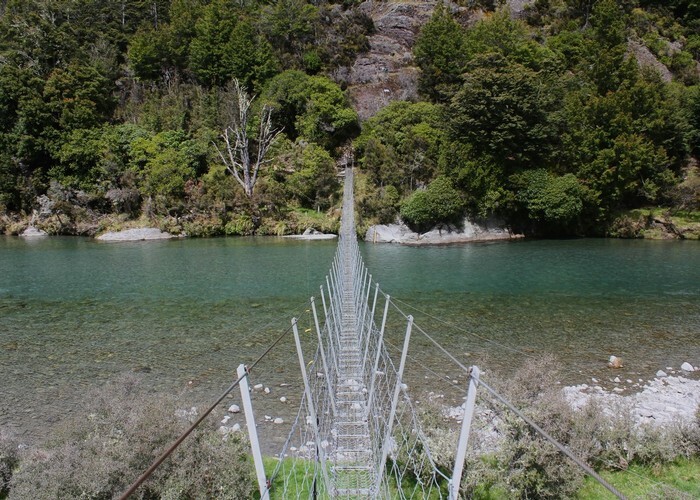 Hurunui Swingbridge • By Matthew. 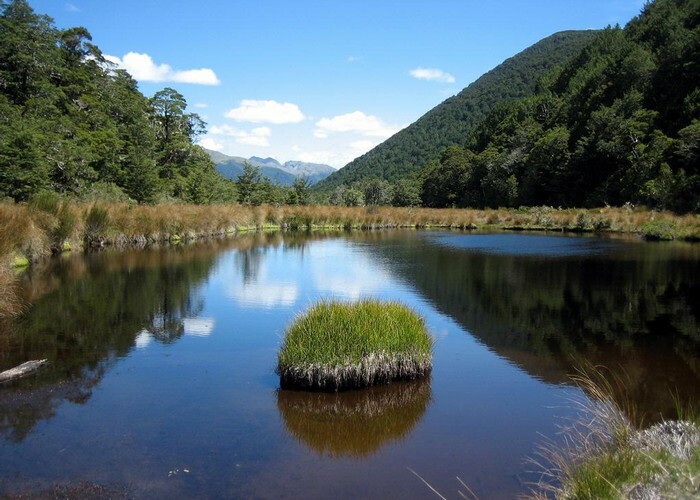 Licence: C.
In the south, the park occupies the dry burned-off hills around the Hurunui River and Lake Sumner itself. 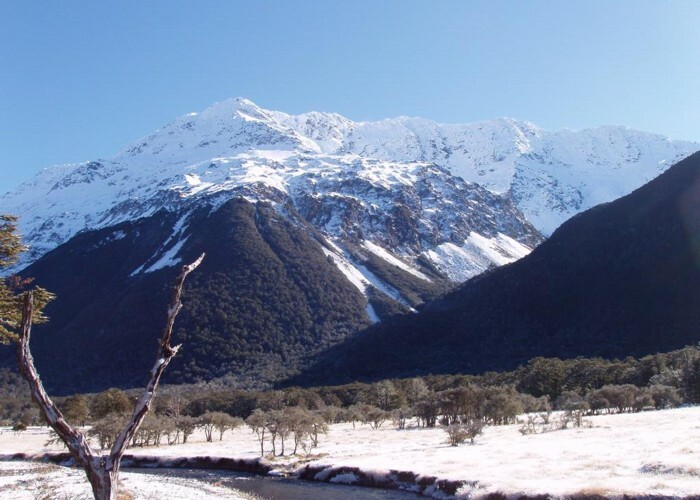 Further north, the park includes the mountains near the Lewis Pass Highway. On the whole, it is not a park for roadside picnickers, but a park you must walk to. And it is a park that is well served by both huts and trails. St James Walkway June 2009 • By Ancient Tramper. St James Walkway car park, Lewis Pass (access to Lewis Tops). Driving time from Christchurch: 2:15. Nina River, opposite Palmer Lodge, marked with "NZDA" (access to the upper Nina Valley, Devilskin Saddle, Sylvia Tops). St James Walkway car park, Boyle River (access to Magdalen Hut and the St James Walkway). Rest area opposite Doubtful River (access to the Doubtful Valley). Windy Point (access to the Hope Valley and Lake Sumner). Driving time from Christchurch: 2:00. Lake Taylor camping area, and end of 2WD access (access to Lake Sumner and the Hurunui Valley). Driving time from Christchurch: 2:20. Sisters Swingbridge (access to the eastern end of Lake Sumner, Gabriel Hut, and the Jollie Brook circuit). Jollie Brook Swingbridge (access to Cold Stream Hut, Jollie Brook Hut, and the Jollie Brook circuit). Camping areas are located at Lake Taylor and Loch Katrine on the Lake Sumner Road. Camping is also available at Deer Valley on the Lewis Pass Highway. Entrance fee: there are no fees for New Zealand conservation parks. Pets: dogs and pets are not allowed in Lake Sumner Conservation Park due to the presence of kiwi. Dogs are allowed on leash at the Lake Taylor and Loch Katrine Camping Areas. Vehicles: 2WD vehicles may drive along Lake Sumner Road to Lake Taylor. The road to Loch Katrine is suitable for mountain bikes and 4WD vehicles only. The park is open to mountain bikes, with good cycling around Lake Sumner. Overnight camping and walking: no fees, registration, or restrictions for the backcountry. Check in at the visitor centre for weather conditions and current information. McMillan tarn • By iangeorge. Licence: C.
Rivers in flood are hazardous to cross. If in doubt, wait it out. Avalanches cross some tracks in winter, spring, and early summer. Be aware of avalanche paths. Amoebic meningitis is a risk at any geothermal pools. Keep your head above water. Introduced wasps are a problem from January to April as wasps feed on honeydew in the beech forest. Wasp numbers peak in late summer. Added 10 June 2006 by MatthewMatthew. 6 revisions, most recently 3 September 2014 by MatthewMatthew. 464 views in the past year (39 per month).